Bandai Namco’s officially-licensed “Mario Kart Arcade GP VR” game for virtual reality will finally grace US shores in October. But don’t get too excited, it’s only coming to the VR ZONE Portal arcade in Washington DC for now. VR early-adopters haven’t seen much in the way of Nintendo characters in the virtual world. This game represents one of the few crossover experiences, and until now it’s only been available at arcades in Japan and the UK. For most of us in the States, this represents our first opportunity to see the classic Nintendo characters in virtual reality since the Nintendo Virtual Boy headset was launched in 1995. So far, Bandai Namco hasn’t announced any plans to bring the game to other US cities or arcades, but there’s always hope Nintendo’s sway over gamers could prompt demand for a larger tour. BANDAI NAMCO is thrilled to be a part of the innovative, cutting-edge project that is VR ZONE Portal. 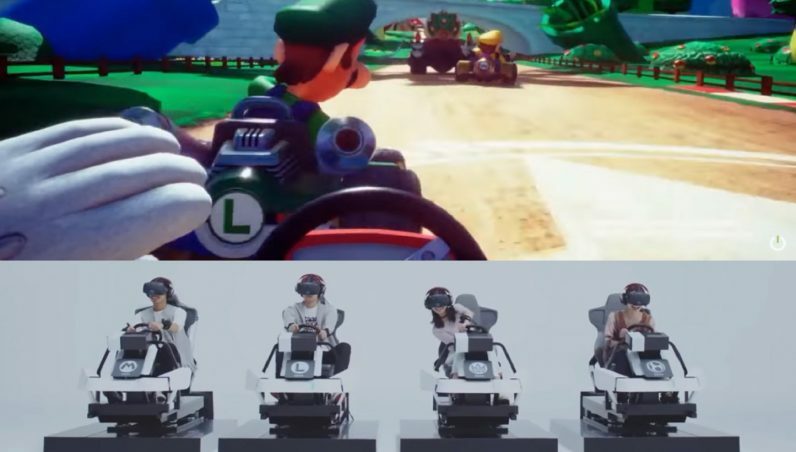 The launches in Japan and the UK brought great success, and we hope to follow suit in Washington, D.C. Mario Kart VR is a long-awaited title and we have no doubt it will be well-received in the states, due to its incredible, immersive game-play and outstanding equipment from HTC Vive. Gamers who do get the opportunity to play the game will need to spend a mere $8 to slip on a headset and find themselves hurtling around a track with their childhood (or adulthood, no judgment) heroes. The adventure features a single course that’ll take players from the Piranha Plant-infested Mushroom Kingdom to the interior of Princess Peach’s Castle. Best of all, the arcade setup features a seated experience complete with a steering wheel and hand tracking (so you can blast people in front of you with a turtle shell by using a throwing gesture). Depending on which cabinet a player sits in, they’ll play as either Mario, Luigi, Peach, or Yoshi. Bowser and Wario round out the starting grid as players’ enemies. While Nintendo is traditionally pretty stingy with licensing, there’s at least some hope for a version of the game that we can play at home. But probably not, despite rumors Nintendo is working on its own VR console — rumors Nintendo denies. John Carmack, legendary developer and current CTO for Oculus, recently stoked these rumors again by saying he believes Oculus will have to compete with Switch if it wants a place in gamer’s hearts. It’s unclear if he’s predicting Nintendo will enter the VR market, or if he’s just making a strange comparison between on-the-go gaming and VR. It’s possible (not probable) that there’s at least some interest on Nintendo’s side in rounding the Switch out as a VR box: Modders recently found a code snippet in the Switch software that indicates there’s a VR mode. But, again, don’t get your hopes up. According to Trusted Reviews, it’s likely a remnant from an Android API or something similar. Not to mention, as writer Alan Martin points out, the Switch has crappy resolution and splitting it in half (VR uses two displays, one for each eye) would result in a VR experience that would make Super NES graphics look polished. No matter what happens next, Nintendo fans in the US can at least rejoice in the knowledge that virtual Mario and crew are making their way to our shores in a few days. “Mario Kart Arcade GP VR” is part of a trio of games Bandai Namco is bringing to the VR ZONE Portal in Washington DC starting October 1, and is scheduled for a six month engagement.